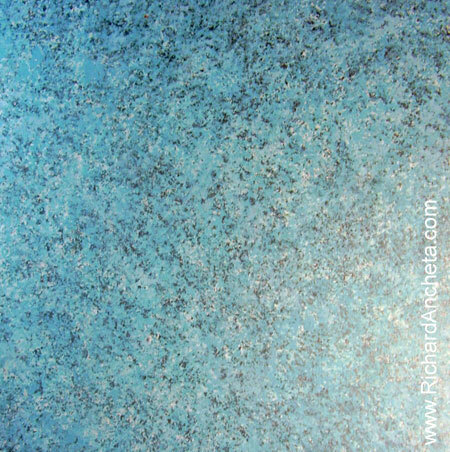 The Azul Bahia granite is also known as Blue Bahia. Granite is a type of igneous rock that is granular and phaneritic in texture and is found all over the world. 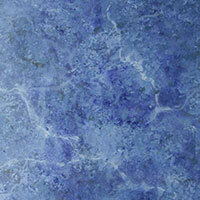 The Blue Bahia granite came from Brazil and is used for countertops, flooring and backsplashes. Faux finish on plywood in marbling technique of sponge, denatured alcohol and veinings by feather. 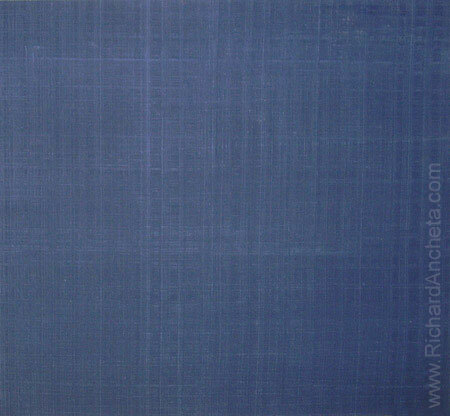 The basecoat is dark blue, with a series of layered glazes of dark, pale and light delft blues. 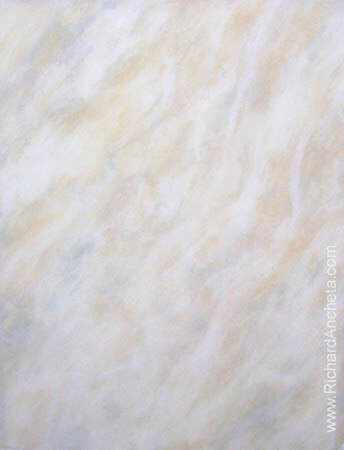 Alabaster is a varieties of two distinct minerals such as gypsum and calcite, a carbonate of calcium, also known as onyx-marble, Egyptian alabaster or Oriental alabaster is a stalagmitic limestone marked with patterns of swirling bands of cream and brown. 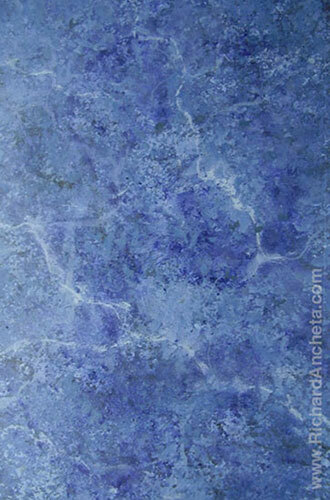 Faux finish on acrylic in a marbling technique applied in the rear side with whites, blue grays and beige oil painting. Travertine is a form of limestone deposited by mineral springs, especially hot springs. 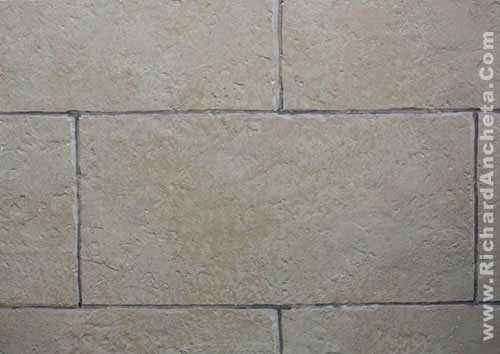 Travertine often has a fibrous or concentric appearance and exists in white, tan and cream-colored varieties. 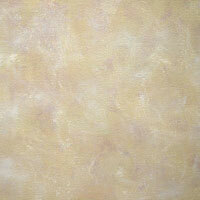 The faux finish is rendered in four tones which is golden beige, light brown, light yellow ocre and light yellow. 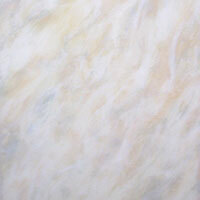 Yellow Sienna Marble marble was specialy design for bathroom, it has five layer texturing such as the orange as the base color and series yellow tones with haching of white veins and finish it with blending of highlights. Column faux finish marbling - oil painting technique. 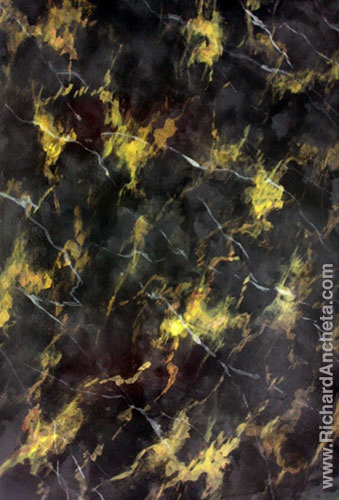 Portoro black and gold mable is a calcite, sleek with erratic light brown and gold veining. 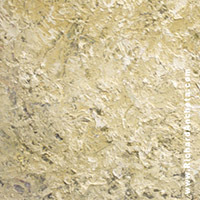 Acrylic faux finishing painting techniques start with ivory and charcoal black in "cissing" technique for the base painting and over coat with glazing of medium and dark gray with marbling technique and splatter of denatured alcohol to achieve organic texture. 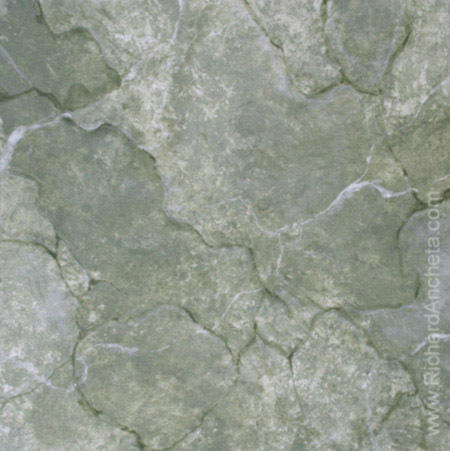 The veining dynamic design are in three layers with the combination of gold, brown, orange and yellow ocre, overcoat with gray veins and thin 50% white veins. 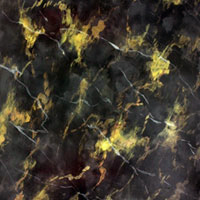 Cipollino marble is a variety of marble used by the ancient Greeks and Romans. 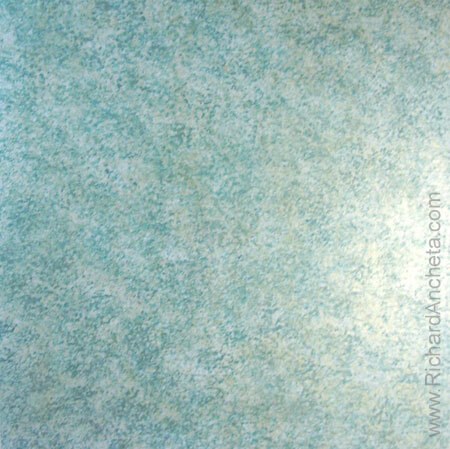 In creating a marble faux finish, it needs 3 shades of green acrylic paints in light, medium, and dark green colors. I use a sea sponge and dip into all three colors. 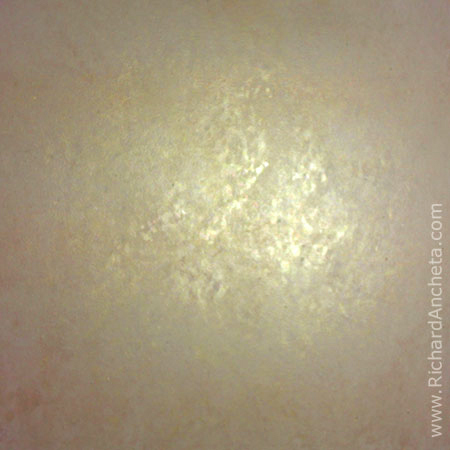 Dab and smear the paint over the surface until it gets the impression. Adding the veins with brush and feather stokes with white glaze and smoothed with soft mapping brush. Faux granite painting is best in kitchen, on countertops gives the appearance of a highly detailed and complicated faux effect. 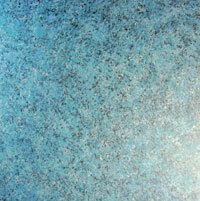 A combination of prussian blue and turquoise color glazings with sponge pointellism faux finishing techniques. 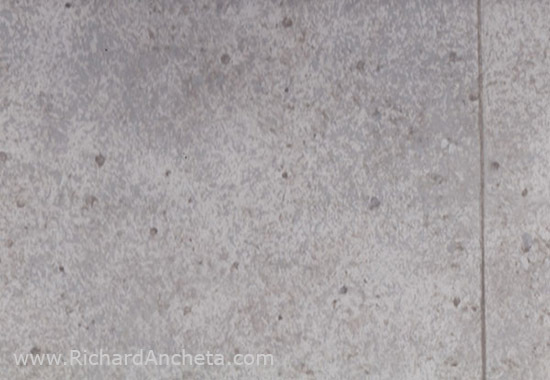 Gray granite is stone wall texture creating a visual of solidity and neutral texture. 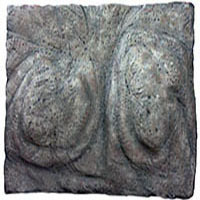 The application of three shades such as universal gray, granite gray and grimmy's gray colors with the faux finishing techniques will create this artwork. 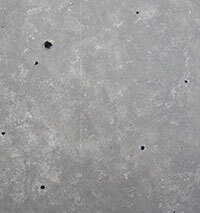 Concrete is a composite building material made from the combination of aggregate and cement binder. 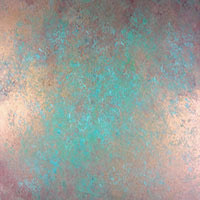 Imitating for faux finish with impasto modelling texturising paste using palette knife techniques and the sand with brush splatter. 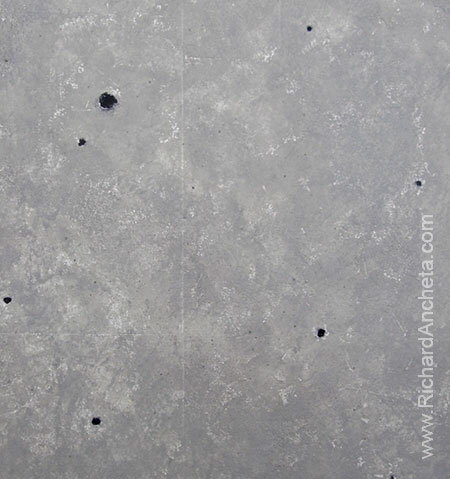 The illussion are achieve by a combination of different layer shades of colored glazes such as light and dark grays with lighter tone on the top layers as highlights, finishing with scattered black holes highlighted with white gives an impression of realistic effect. 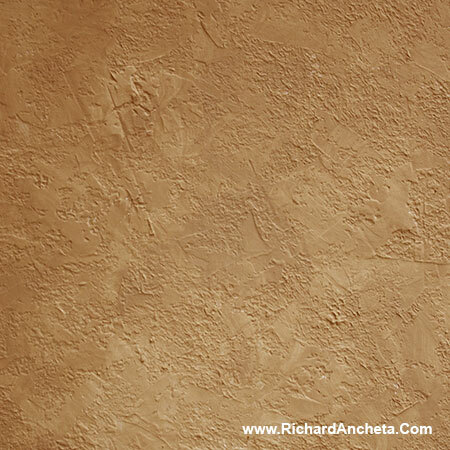 Model project for Concrete faux finish on ceiling. 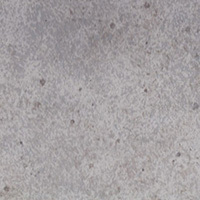 Rough cement texture, painted of 3 layers of colors of beige for the underground, lighter beige in the second layer and highligted with light beige. The application of second layer and the upper layer is a sheep skin stampping technique. 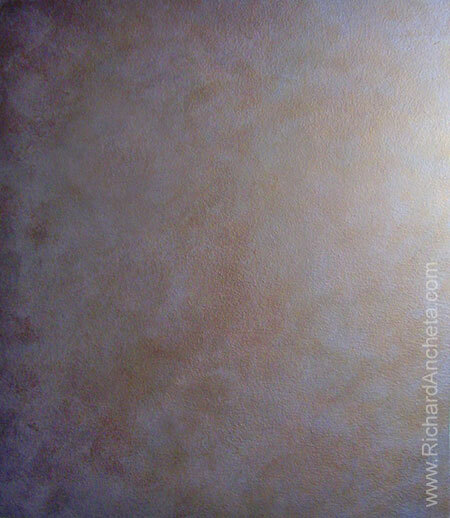 The beige rough finish and semi-rough gray stuco texture, with the plaster and with the texturizing tools. After it dries, I score the gap depth of the stone blocks to define pizza shapes with imperfect cutting of the stones. The color rendition are derive from actual wall which layered in four range of beige and the grey blocks are overlap with the three layers of beige. 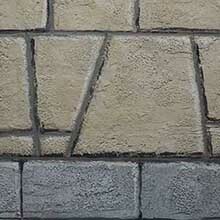 The masonry wall tile is design with slight finer texture and polished stone effect. 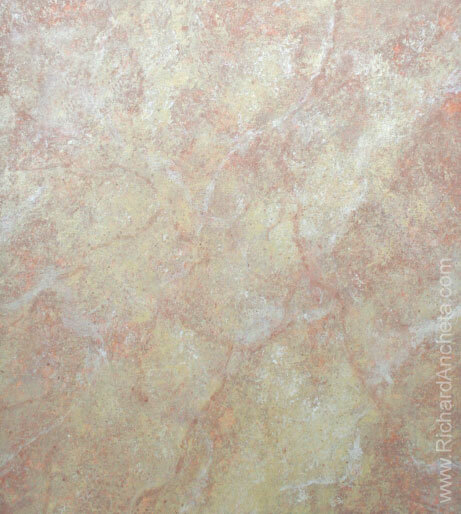 This artwork of roman stone wall design are blended with three colors of dark beige from its base and a mix of hotter and pale tones. 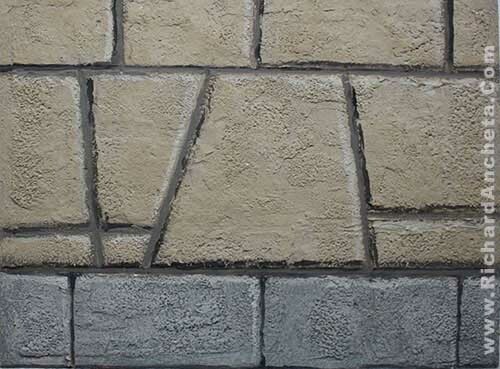 With the use of sheep fur technique, I have achieve the painting texture of the real stone wall model. Shades and shadows are important, the cast of strong highlight define each details and enhance the solidity of the wall. A simple and easy faux finish effect, the walls are texture with dry dex filling compound with the sea-sponge, creating muddy effect and flattened with pallette knife, the color is glazed with foam of red brown mud mate acrylic. 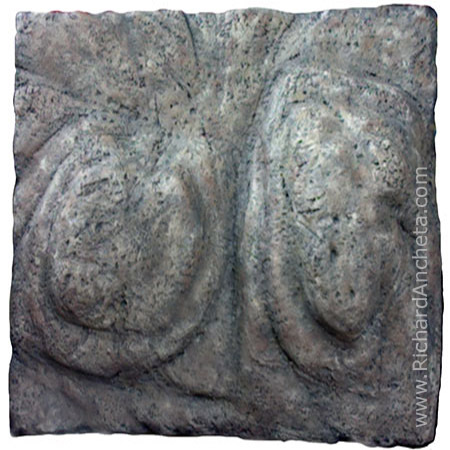 This Stone cave faux finish is a sculpture and carving on styrofoam, with the use of sharp cutter and hand saw give its textures and carv the volume of the stone, sanded to remove crush pieces, heated with heatgun, textured with steelbrush and faux painted with the local earthtone colors of the stone. 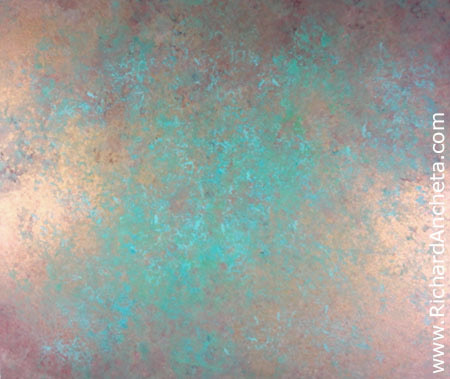 Metallic bronze oxydized, the patina is a tarnish that forms on the surface of bronze, copper and similar metals produced by oxidation or other chemical processes. Also to stone, a sheen on wooden furniture produced by age, wear, and polishing or any such acquired change of a surface through age and exposure. 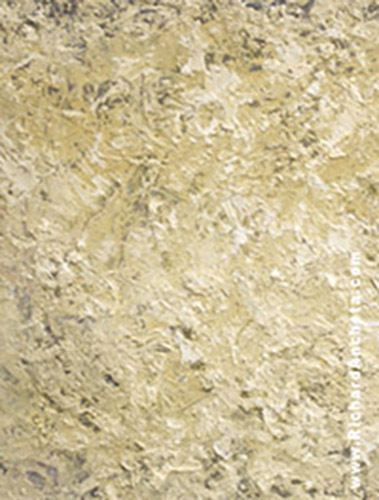 Suede color base Toffee Crunch makes the illussion of uneven tones overlapping color layers of beige, light browns and the upper layers are metallic silver mixed with gold and glazed with metallic bronze. When it was lighted the beauty sparks the elegance of the combinations of the metallics and on the the opposite is the holographic illussion of suede and its textures. Each layers are series of tones of emerald greens with the glazing and sponge faux technique using acrylic gold paints. Room with hammered texture and harmony designs. 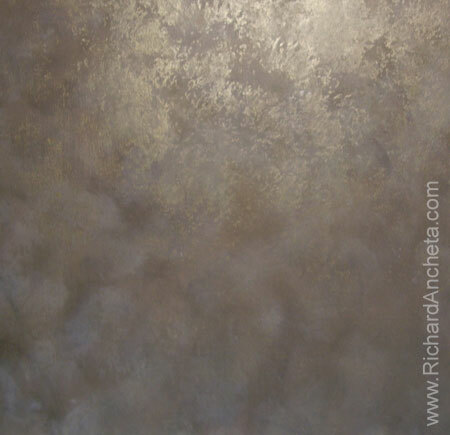 Decorative faux finish with beautiful natural reflective stone patterns with bronze and silver underlayers and highlighted with metallic gold. The layers starts with a base color of alencon lace, champagne mist (70% silver and 30% gold) and glazed with the series of layers of metallics using woolie and sponges. 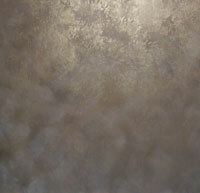 Interior Decoration with Metallic Champagne Mist - Faux Finish. 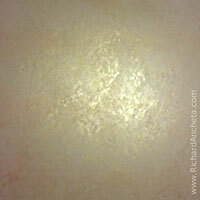 Golden brown texture finish with gold spots is a different strokes design for ceiling decor. 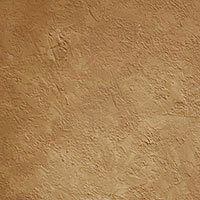 This texture finish is c reated to harmonized the antique finishing of the interior decoration. 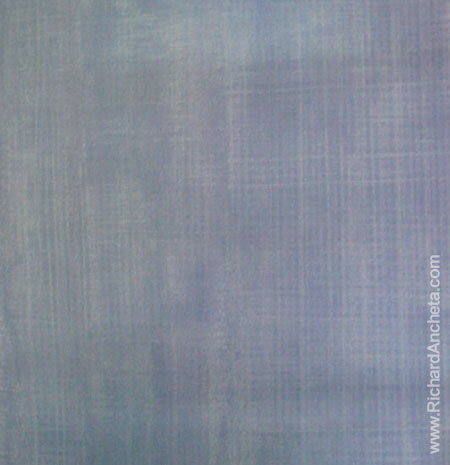 Cross section of bamboo stripes creates beautiful organic texture of native and exotic neutral colors. 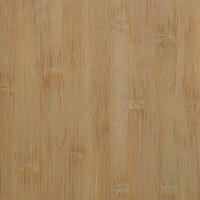 Bamboo as the stongest natural materials was design for furnitures and moldings, the most widely application is for the faux bamboo wall texturing. 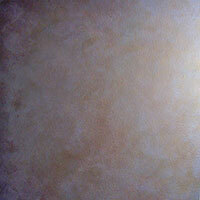 A combination of different fine brushes and graining tool to create the faux finish impression. 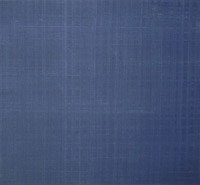 Indigo denim faux finish brings casual comfort of a favorite denim jeans decorate on the walls. 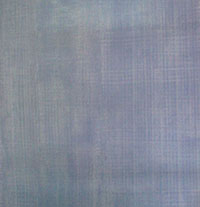 Using a wallpaper brush to create denim fabric pattern by dragging with freehand horizontal and vertical strokes, weaving the texture finish of the denim. Faux painting or Faux finishing ( faux fini / finis - French ) are terms used to describe a wide range of decorative painting ( peinture décorative ) techniques. 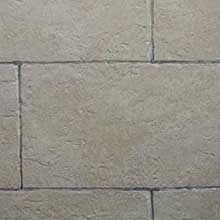 The naming comes from the French word faux, meaning false, as these techniques started as a form of replicating materials such as marble and wood with paint, but has subsequently come to encompass many other decorative finishes for walls and furniture. 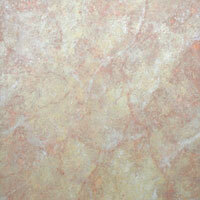 Faux became hugely popular in Classical times in the forms of faux Marble, faux Wood, and Trompe l'oeil Murals. Artists would apprentice for 10 years or more with a master faux painter before working on their own. Great recognition was rewarded to artist who could actually trick viewers into believing their work was the real thing. Faux painting has continued to be popular throughout the ages, but experienced major resurgences in the neoclassical revival of the nineteenth century and the Art Deco styles of the 1920s. Throughout the recent history of decorative painting, faux finishing has been mainly used in commercial and public spaces. 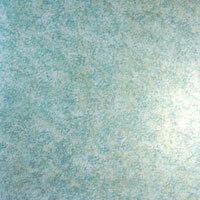 In the late 1980s and early 1990s faux finishing saw another major revival, as wallpaper began to fall out of fashion. At this point, faux painting started to become extremely popular in home environments, with high end homes leading the trends. While it can be quite expensive to hire a professional faux finisher, many faux painting methods are simple enough for a beginning home owner to create with a little instruction. People are also attracted to the simplicity of changing a faux finish, as it can be easily painted over compared with the hassle of removing wallpaper.